Nihongo Instructor Club Japanese Language School in Azabu, Tokyo, Osaka and Nagoya. An izakaya　is a type of Japanese drinking establishment. The food is usually more important than in other types of drinking establishments in Japan such as bars and snack bars. They are popular, casual and relatively cheap. 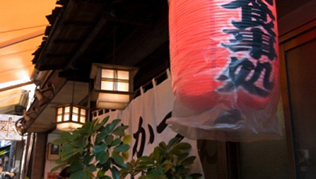 Izakaya are sometimes called Akachochin (lantern made of red papers), because these paper lanterns are traditionally found in front of an izakaya and often used as the signs for cheap drinking and eating. The izakaya or akachochin may be considered the Japanese counterpart of the English pub. In the izakaya, customers sit on tatami mats and dine from low tables in the traditional Japanese style, or sit on chairs and drink/dine from tables. Many a izakaya offers a choice of both. Following an oshibori (wet towel) to clean your hands with is an otoshi or tsukidashi (a tiny appetizer). This is usually charged on the bill in place of an entry fee. Food and drink are ordered throughout the drinking session as desired. They are brought to the table, and the bill is added up at the end of the session. Usually foods are shared by everyone at the table. Rice dishes such as ochazuke(boiled rice with green tea poured over it) and onigiri (rice ball) are sometimes eaten at the end to complete a drinking session. Chotto ippai meaning “have a quick drink”. is a frequently heard expression among salaried workers. Sitting down together for a drink at izakaya after work gives them chances to exchange information and opinions and to get rid of their stress at workplace. In either occasion this expression is used to asking for a quick drink at izakaya together. The boss says chotto ippai doちょっと一杯どう? to his subordinate when he wants to advise him privately or to hear his suggestions and complaints. Izakaya also plays an important role when a group of co-workers stops off at a izakaya nearby after work to get relaxed and talk off the stress of everyday work. Izakaya is the drinking place where friendship and trust can occur, enhancing good relation among Japanese salaried workers. It is called nomunication ,a compound word made up of nomu (to drink) and communication. Izakaya were traditionally down-to-earth places where men drank sake and beer after work, but nowadays they attract the more various clientele including working women and female students by improving the interior and diversifying the menu. Izakaya are often used for matchmaking parties (go-kon) and drinking parties like a year-end party (bo-nen-kai). Do you prefer having lessons at your own place at your own convenience? NIC can dispatch Japanese teachers. Copyright © NIHONGO INSTRUCTOR CLUB. 2007-2019 All Rights Reserved.